Todays 16k gold price per gram is $27.35 This price is current and the page updates every 30 minutes with the most recent gold price (just hit refresh or F5). Bookmark and share this page then come back whenever you need to know the price of 1g of 16k gold jewelry or scrap. 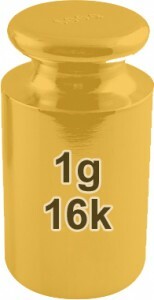 Note 16 karat gold is 66.7% gold with the other 33.3% being a metal alloy of insignificant intrinsic value. Need to figure out the price of something besides 1g, like maybe gold in ounces? If so use our Scrap Gold Calculator below, it’s totally free and displays the most recent gold prices. Prices are figured using troy oz scale and not standard oz. What does this mean? Well a troy ounce is 31.1034768 grams not the usual 28.3495 grams, and to get the true price per gram we must use troy.